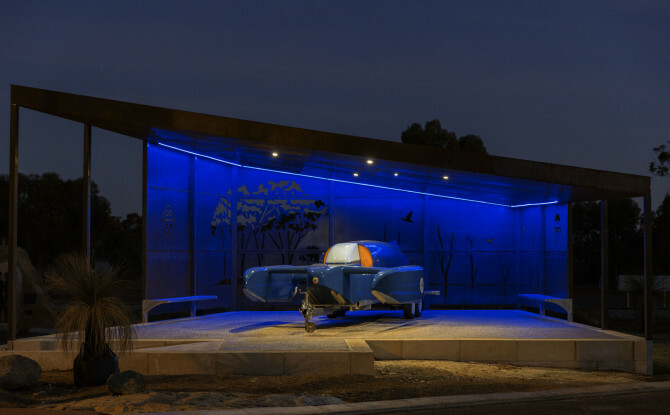 Over the past 18 months the Shire of Dumbleyung and community members have been strived towards to development of a shelter for the Bluebird replica, which will form part of the attraction when visiting Dumbleyung. 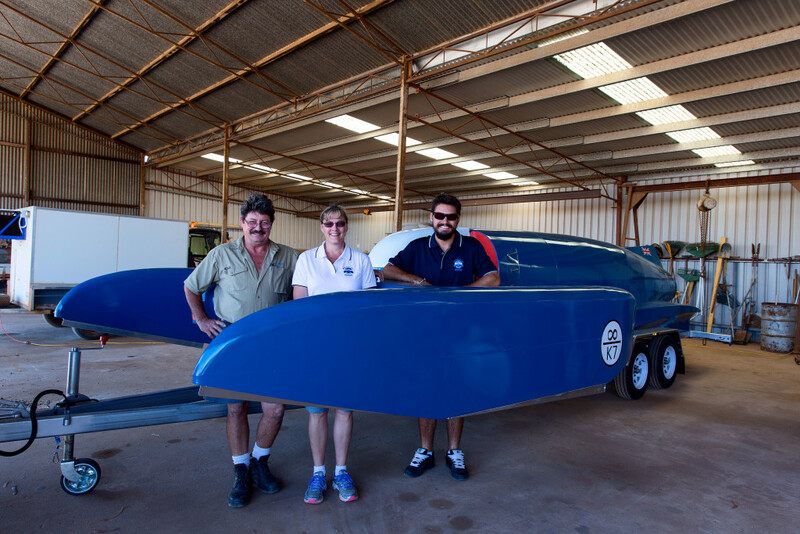 The Bluebird replica was built in 2014 by Mark Motzouris of Statewide Boating, Jurian Bay, and was a huge undertaking by Mark, his wife Hilary and son Johnno to get the dimensions correct with very few plans available, and to shape and build an accurate model. The Bluebird arrived in Dumbleyung on the eve of the 50th celebrations of Donald Campbell’s World Water Speed achievement in 1964. 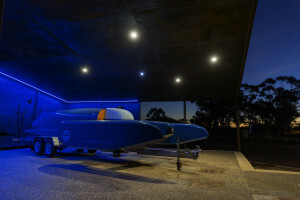 A huge celebratory event was held with many people, even some of Donald Campbell’s original team members from Barmara in South Australia, where Donald Campbell attempted the record earlier, returning to the town. 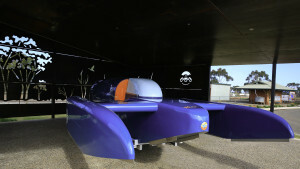 The Bluebird replica was unveiled by Gina Campbell, Donald’s daughter and a speed ace in her own right, Joan Ward, wife of Col who was instrumental in suggesting Lake Dumbleyung to the Campbell team, and Owen Dare, a Freeman of the Shire of Dumbleyung. 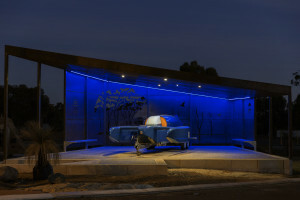 The Bluebird replica shelter was built by Bruce Rock Engineering, who took the project on and worked closely with members of the Bluebird Interpretative Committee, led by Carmen Bairstow, and the Shire of Dumbleyung, to fine tune a suitable display that has turned out to be a work of art in itself. The scenic laser cut backdrop in the back and side walls were designed by Amy Bairstow. A great deal of work has been done by Shire of Dumbleyung workers and volunteer members of the community, and they all need to be thanked for their incredible effort. The ramp up in to the shelter has just been paved with pavers that have names of community members and business’s who have contributed to the Replica build and the shelter. 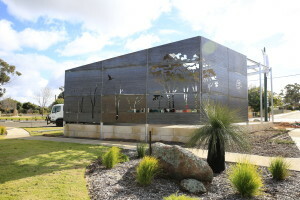 A local builder and handyman, Murray Hudson, has done many hours of brickwork and paving. The Bluebird replica is a sight to see during the day and at night is very special with blue lighting and lights in the roof set out as the Southern Cross start constellation, an inspirational idea by BICC member Louisa Dare. There is still some final work and information panels to be installed, but for now the Bluebird replica in Dumbleyung has its new forever home. Absolutely wonderful, and a great tribute to a very brave and patriotic man. As Gina has said, Australia and Dumbleyung, in particular, have celebrated Donald’s achievements more than in his own Country.